If there is one thing those from Youngstown love to talk about whenever they meet up it is where to find good pizza, particularly pizza made the “Youngstown way.” That was sure made clear to me in the response to a recent post on visiting the Wedgewood Pizza in Grove City. One woman just commented on the post that she drives from Granville, Ohio to Grove City (about a 50 mile drive each way) just to get Wedgewood pizza. Those of us who don’t live in Youngstown are that desperate! Growing up in Youngstown, pizza seems to have been a Saturday night thing for many of our families. In the days when the men went to the factories and expected dinner when they got home, this was the day mom got a break. Even though my wife and I grew up on different sides of town, both of us have early memories of Saturday night pizza’s from Petrillo’s pizza, either from the Struthers area one for my wife, or the west side one for me. Our memories were of sheet pizzas cut in squares, usually pretty basic–cheese, lots of sauce, and pepperoni. I suspect both of our families opted for it because it was cheap and you got a lot for the money. Later on, when I was in high school, I discovered Molly O’Day’s (or O’Dea’s, not sure of the spelling) pizza, made in a kitchen of the bar by that name on Salt Springs Road not too far from the mills. This was thanks to a girl I was dating at the time who lived near there. I put my family on to it, and from then on it was the standard until the cook left, after which it was never the same. I think that pizza represented for me the “Youngstown way” for making good pizza–although I wouldn’t be surprised to get a few arguments here! It had a thick, but light and not doughy crust. The sauce was rich, not thin like so many pizzas elsewhere, and this great mix of sweet and spicy. It was not slathered with cheese, but well covered without forming a “cheese mat”. The ingredients (we often just got pepperoni and green pepper) were generous without being overwhelming. It seems that the favorite “date night” pizza place for many of us was the Pizza Oven just off of Market Street on Southern Boulevard near the old Sears Roebuck store and not far from the Uptown Theater. On a Friday or Saturday night the place would be packed and I don’t think anyone was over 22. We were students on campus when Inner Circle Pizza came to Youngstown and that tended to be our go-to place if my girlfriend and I (now my wife!) wanted to grab a pizza between classes or before an evening event on campus. Later on they opened a store on Mahoning Ave not far from my folks and that became their favorite. Of course there were lots of great places to get pizza in Youngstown. Wedgewood and Belleria get mentioned a lot by Youngstowners in Columbus because they have stores here. But there is the Elmton in Struthers, Cornersburg Pizza (we’ve had some great pizza’s out of their Boardman store when we’ve been back to Youngstown). St Anthony’s Church (link is to a YouTube video of how they make pizza) has been mentioned by many for the best Brier Hill pizzas. When my parents moved up to the North side and lived at Park Vista, we’d run up to the Avalon Gardens to get Brier Hill pizza (I gather they have now moved to downtown Youngstown). I don’t doubt I am probably overlooking at least twenty-five other good places to get pizza in Youngstown and the surrounding areas like Girard (I hear Pizza Joe’s is good), Campbell, Lowellville, and others. No doubt that so much of the good pizza in Youngstown is attributable to the strong Italian-American community in Youngstown. I suspect that so many of the pizza places took grandma’s recipe and just kept perfecting it in this competition for Youngstown’s pizza dollars spent by people who knew good pizza. Pizza was one of the ways you kicked back and celebrated what was good about life, ideally accompanied with a cold beer. Pizza was a break from the everyday — for husbands, wives, and kids alike. When did your family have pizza growing up? What were your favorite places? And what should we try the next time we are in Youngstown? Want to read other posts in the Growing Up in Youngstown series? Just go to the “Growing Up in Youngstown” category on my homepage. “Growing Up” Catholic, cheese pizza was dinner of choice on (don’t eat meat) Friday’s. Grew up in the San Fernando Valley (Los Angeles area) – no special pizza here then. Not sure now as my wife keeps eyes on our diets and brown rice/tofu pizza just doesn’t cut it. 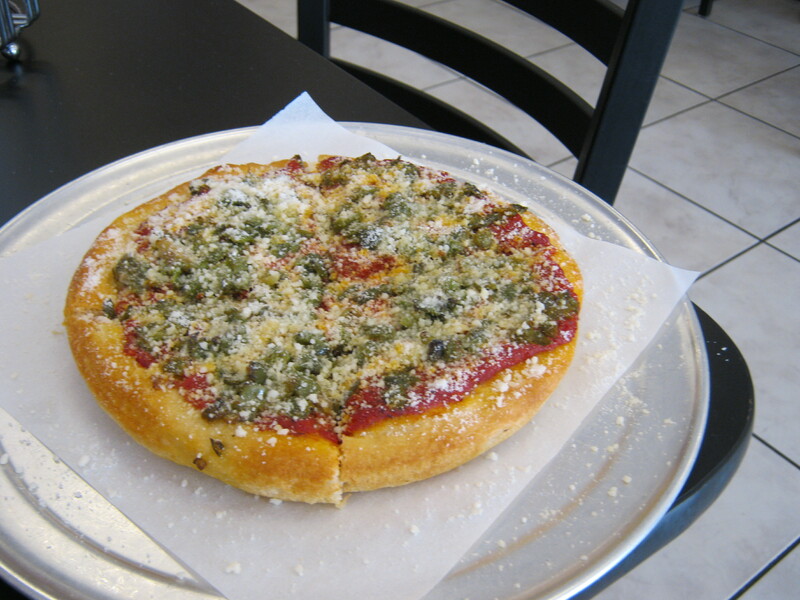 You might have liked Youngstown’s Brier Hill pizza–sauce, green peppers and Romano cheese. One of our Catholic churches sells them every Friday. Interesting idea! You are right about Youngstown pizza spoiling you. As a teen and still to this day…it’s not a party without pizza! You can’t go wrong with Youngstown area Pizza. Grew up on the South Side — your reference to “sheet pizzas cut in squares” really resonates — Josephs Italian Pizza, first he was at the corner of Southern Blvd and Midlothian and the moved right by St. Dominic’s at Southern Blvd and Lucius — my father worked 3-11 for the railroad and every Friday night would drop a buck (squares were initially $.10 and then went up a crazy 50% to $.15) to bring a box home. Always just cheese and sauce but I remember it was really tasty. John, several others commented on Facebook about Josephs. Incredible that you could get a pizza to feed a family for a buck or two! Still a lot of good places preparing that style in the area. Rustbelt Pizza. Fernando’s Wedgewood is one of the best- but so many similar places in the area. Pizza Joe’s was always good. Westgate Pizza on Mahoning Avenue, Don’t forget Avalon Gardens, Coca’s Pizza (and video!) La Rocca’s, Ianazone’s, Little Jimmy’s, Tommasino’s, Salvatore’s, Scarsella’s, Noday’s Deli etc. etc. I am curious about the evolution of the pizza in Youngstown/Northeast Ohio. I believe it is descended from the Sicilian pizza. Saturday was our pizza day, and Bellaria’s was our choice. Gaetano’s on 442 in Campbell was the quick fix, since we lived in the Lincoln Knolls neighborhood on the east side. Saturdays for us too! We were bummed when Bellaria’s closed its Columbus location this winter. I grew up on the South Side and spent lots of time at Puzza Oven. For takeout, though, my dad always went to Chris-Mary Pizza in South Avenue. Two older women who made delicious thick but light crust pizza. I think one of the secrets of Youngstown pizza was green pepper cooked in the sauce. We never had peppers on our pizza but there was a rich peppery tomatoe sauce on the pizza. 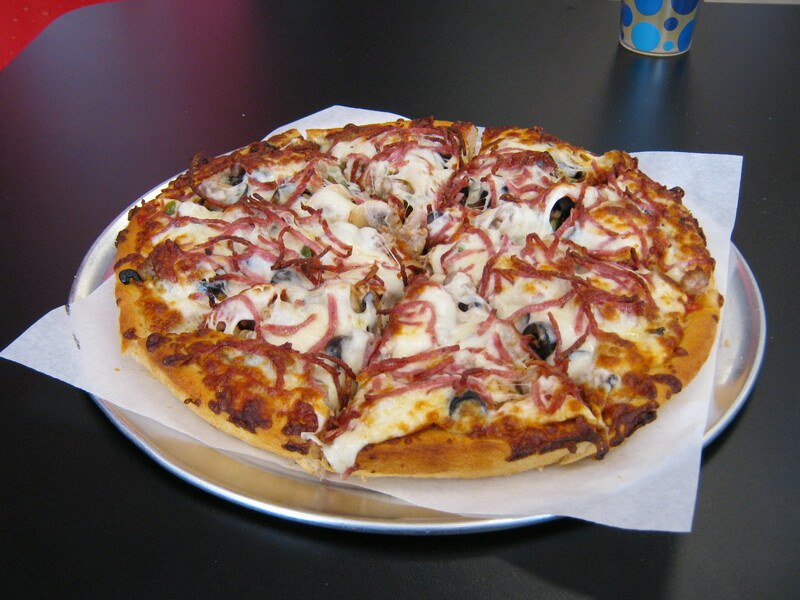 We had many date nights at Pizza Oven as well–probably sat across from you at some point! How about a slice of pizza and a beer from the pub on campus? I remember the pizza being kind of different but still good. Loved Uptown, Cornersburg Pizza in Struthers and so many more. People here in Atlanta don’t understand good pizza. I refuse to eat all these fancy pizzas like BBQ, cheeseburger and so much more. Too me a plain cheese pizza from Uptown was perfect! Trying to remember the pizza at the pub. Had plenty at the old Inner Circle on campus. The pizza at the Pub had whole wheat crust. That’s what made it different. I remember getting it with shrimp during the week of YSU’s beach party. Willie, I think we feel that way wherever we live. The only good pizza in Columbus is the Wedgewood pizza in Grove City–owner learned from the guy at the original Wedgewood. There’s so much to say here….we here in youngstown are spoiled by all the places here for really splendid Italian food , let alone the pizza !! I also don’t go for the ” gourmet pizzas ” , like BBQ .chicken pizza , or anything like that . A ssausage and cheese pixxa always suits my palate just great ! Uptown does a wonderful job…they can “burn ” tghe cheese just enough and it really adds to the overall flavor….Wedgewood , the original Belleria , Westgate , the Elmton…all produce , and have been knocking out top.notch pizzas for years . Also…the new chain called Marco’s Pizza and Video…not a bad pizza there , and The Golden Dawn on the north side has always made a good…and cheap pizza…try it . both in Austintown and Liberty. There are many GREAT pizza shops in the area. Youngstown is the “Capital” of pizza. My personal favorite is “Uptown Pizza” on Belmont in Liberty! Maybe Youngstown could host a national pizza convention, or become a pizza tourism destination! Well some of are favs are for sure Belleria, then how about Nicky’s Pizza on McCartney Rd. It was formly Cornersburg when it opened in the early 1970’s, and it still a fav of our sons when they come home from Westerville & NYC. By the way all of you Cbus folks, do you know Carsonie’s I. Westerville and Upper Arlington is owned by the Carsonie family who had the Inner Circle on Lincoln @ YSU, let Frank know you are from Ytown if you stop in! Just found your blog and just love it…all our wonderful memories growing up in the wonderful Ytown area!!!!!! Hey glad you found us and thanks for the tip about Carsonie’s! Since I wrote this post, Bellaria’s pulled out of Cbus–only one Wedgewood Pizza place left. Have to check out Carsonie’s! I loved the Inner Circle on Lincoln! You’ll definitely know some of the favorites on Inner Circle are on Carsonie’s menu…we always go to the one in Westerville…the one in Upper Arlington is newer, just opened a year or so. Hope you like it! DYK…that Westgate Pizza in Youngstown uses the same sauce and dough recipe as the old Petrillo’s in Ytow. Saltone’s in Girard way back in the day. Don’t forget the Sunrise in Warren (the bar pizza). Also like Tangiers on Yo-Pol Rd. But Petrillo’s was the family got to. Especially when the coupons came out in the Vindicator. Nobody mentioned Westgate Pizza! I treated my daughter in law last time I was “home” and she immediately loved it. We had to go get a sheet for supper that night after my son got off work. Southgate Pizza in Boardman uses the same recipe and it’s awesome too. A number did on Facebook when I posted this there. Apparently I missed out on some good pizza! Cornersburg Pizza in Boardman was my favorite. However, they have slipped a bit upon my returns since being bought. Such is life.